Coloma Valley, the home of the Gold Rush, lies in the Sierra Foothills about an hour's drive from Sacramento. Through its center flows the South Fork of the American River, made famous in 1848 when gold was discovered in its stream bed at Sutter's Mill. When news of the discovery reached San Francisco, it triggered the 1849 California Gold Rush, dramatically changing our country's history. Today this area is known as a great place for family fun and as a lure for history buffs far and wide. Along these same gold-bearing river banks lie the beautiful rural communities of Coloma and Lotus, with their ranches and orchards, cafés, vineyards, B&Bs, campgrounds, and small-town businesses. Three riverfront parks provide opportunities for family picnics and wading; and Marshall Gold Discovery State Historic Park brings California's history to life. Placerville, well-known for having a colorful Gold Rush past as well, is minutes away. The Olde Coloma Theatre offers weekly melodramas and a Winter's Faire. The annual old-fashioned Christmas features period crafts and food, music, strolling musicians, historic trade demonstrations, 19th-century children's games, wreath making, and a visit from Santa. During the year are Kids' Discovery Days with candlemaking and more events. 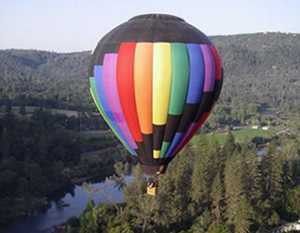 You can rent a bike or plan a group hot air balloon ride. Nearby places to stay include the Historic Sierra Nevada House in Lotus, the Coloma Country Inn right next to the park in Coloma, the 19th Century Albert Shafsky House B&B, Blair Sugar Pine Inn B&B, and Cary House Hotel in nearby Placerville, also the Eden Valley Inn B&B located between Placerville and Coloma.